Today, I would love to talk to you in more depth about beliefs and how they shape our lives. I have studied and participated in many courses in which this topic is widely discussed. It all comes down to this: certain beliefs can seriously limit our development and growth if we don’t do something to eliminate them. What is a belief? It’s a feeling of being sure that something is true. A belief is merely a thought or an idea that we kept thinking until we became convinced that it must be true. We might have read the idea somewhere (book, Internet, etc.) or heard it from any of the following: friends, family, teachers, religious leaders, and politicians. The idea resounded with us and we adopted it as the truth. What we believe is not always true. People used to believe that the Earth was flat and at the center of the universe. People used to believe that heavier than air flight was impossible until the Wright Brothers came along. Running a 4-minute mile was also thought to be impossible until Roger Bannister ran it 3 minutes, 59.4 seconds on May 6, 1954. (You can watch Bannister’s historic race on YouTube.) After that limiting belief was shattered, thousands have since run the mile in less than four minutes. In fact, Bannister’s record lasted only six weeks. Many beliefs come from social conditioning. For example, if we are religious they come from our religious affiliations and so on. Some of them are wonderful and uplifting, but many, unfortunately, do us no good. Let’s discuss this topic further with some examples. I’m all about practical learning. Thought: I’m not good enough. Feeling: I feel small and insignificant; I feel unworthy. Action: You either take no action or uninspired actions, already convinced that you will fail. You stay in your comfort zone. The above scenario not only plays out for many people, it spills over into multiple areas of their life: career, money, relationships, health, and the list goes on. Could you have one or more self-limiting beliefs that, once shattered, will open up a whole new world of possibilities for you? If so, why not just eliminate them from your mind? It turns out that you can’t just erase your old beliefs. Abraham-Hicks said that a “thought once thought is never gone.” But, don’t worry. There’s no problem whatsoever. What we will do is replace your old beliefs and create a beautiful set of new affirmations, incantations, thoughts and words that you will repeat as your sutras. These will become your new prayers. Now, take a look at your belief from another perspective. Look around the world and ponder this – do those that work hardest make the most money? Of course not. It’s about working smart, not working hard, isn’t it? And, it has nothing to do with education. The smartest people are often stuck in rat race working 40+ hour weeks at an unfulfilling job. 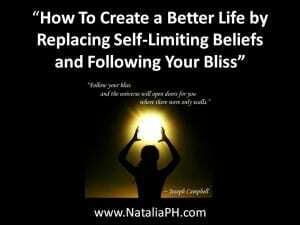 So, how can you replace your self-limiting belief? Focus upon and repeat your phrase multiple times each day. You must believe it. See yourself in a scenario having already fulfilled your desire. Feel the feeling of accomplishment. By doing so, you send that intention to the Universe. Also, start reading inspirational stories of people who have already achieved greatness by doing what they wanted to do with their life instead of trying to meet the expectations of others. Do this especially if you experience peer pressure from people around you (friends and family), who often try to impose their own limiting beliefs on you, even if they are well intentioned. It helps to know that others have taken the road less traveled and have succeeded. You won’t feel like a lone reed. If you really, really want something and have a burning desire to create a purposeful, beautiful, prosperous life, you need to focus on your achieving goals and becoming the kind of person it would take to do so. Basically, “follow your bliss” and you will not only create the life of your dreams, you will also inspire others by your actions. There is no need to convince anyone of your ideas, just take inspired action and you will lead by example. It’s as simple as that. Often people lose track of their goals, as they try to please someone else and/or meet other people’s expectations. The key to being successful at anything in life is to focus on your goals and needs first. Then, you will the most amazing person who inspires others. For some this might sound selfish. But, remember that when you are flying, flight attendants tell you that in case of emergency you are to put oxygen mask on yourself first before trying to assist anyone around you. What good are you if you are not breathing? What good are you to others if don’t take care of yourself first? Ok, so back to your belief about money. Focus on your new thought: “I easily receive an abundance of money by doing what I enjoy and I am good at.” Ponder it, digest it, and repeat it over and over again. Discipline yourself into believing it. Also, see yourself and feel the feelings of your goal already accomplished. Also, understand that the past is the past and your power is in the now. Grab it, claim it, and turn your life upside down. If you keep on focusing on your new thought and taking inspired action, amazing results will follow. You will be able to truly enjoy your life as you were meant to. For more on this topic, I’d like to encourage you to visit my free video training series at Mindset-Academy.com where, I provide you with a set of exercises to get you started on replacing limiting beliefs. You are also most welcome to contact me and book a private life coaching session at my coaching page. If you got inspired, visit my blog and subscribe yourself to a free portion of positive brain food, that I send out 2-3 times per week to help you stay on that path of enlightenment and love. Wishing You a beautiful day/night whenever this post will find you. "How to Cast a Vote for Those Who Do Not Have it Yet..."